UPSEE Syllabus (उत्तर प्रदेश इंजीनियरिंग प्रवेश परीक्षा पैटर्न, सिलेबस) 2017: Candidates who are searching for the Syllabus of UPSEE 2017 are advised to follow the complete details mentioned below. The seekers are informed that the questions will be asked from the Physics, Chemistry, and Maths syllabus of 10+2 standard. We have included the complete Subject-wise Syllabus of UPSEE 2017 and the candidates will be able to access the topic wise syllabus from the details mentioned below. If we talk about the UPSEE Exam Pattern 2017, then we want to conclude that 150 (P:C:M = 50:50:50) questions will be asked and all the questions are of objective type. Each question carries 04 marks, so maximum marks that can be obtained are 600. The total duration provided to solves these 150 questions are 03 hours (i.e. 180 minutes). All those candidates who are looking for the study material to prepare themselves for UP engineering entrance exam 2017 are advised to follow the below given UPSEE subject wise syllabus. The questions will be asked 10+2 standard Math, Chemistry and Physics syllabus.We have included all the topics that compose the complete syllabus of UP state entrance exam 2017. It is very crucial for all the candidates to follow the latest and updated syllabus before start preparing for the entrance exam to redirect their efforts on a path to qualify the Uttar Pradesh engineering entrance exam 2017. The UP state entrance exam is an offline objective type exam that is conducted every year. 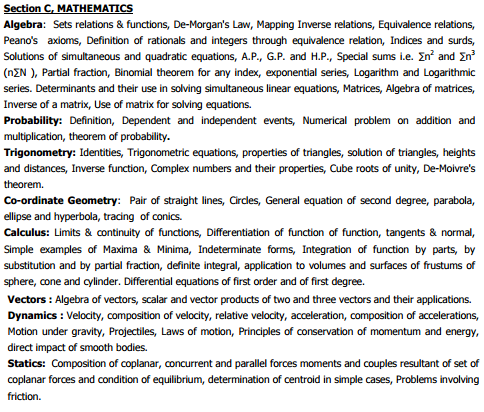 The questions that are asked in UPSEE is based on class 11th and 12th syllabus from Physics, Maths, and Chemistry. Total 150 questions will be asked (50 questions from each subject). Each question carries 04 marks, so maximum marks are 600. Examination Mode: Offline mode with pen and paper. Candidates will be able to access the sample papers to practice for the UPSEE 2017. By solving the UPSEE Previous Year Papers, candidates will get assistance in solving a variety of question and improving the speed for solving various sections from Physics, Chemistry, and Maths. Candidates will also be able to access the UPSEE Solved Papers, by using the given study material candidates will be able to score qualifying marks in the entrance exam. Candidates can check here the complete Seat Allotment process for UPSEE 2017 here. After the declaration of the cut off/ result, the selected candidates will be called to register themselves for UPSEE Counselling 2017. After that, the seat will be allotted to the deserving candidates as per the choices filled in the counselling form and UPSEE Merit 2017. It is necessary for all the candidates to follow the correct syllabus and exam pattern before start preparing for the UP State Entrance Exam. 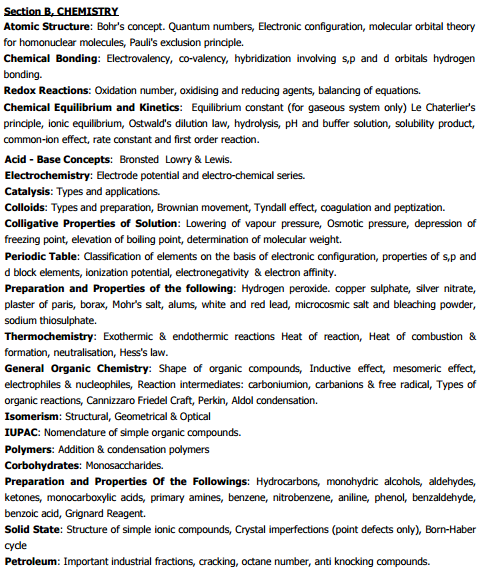 The Syllabus of UPSEE 2017 is same as that of 10+2 Physics, Chemistry, and Maths syllabus. The exam is of objective type and will be conducted in offline mode. There is total 150 question in the entrance exam (50 question from each PCM). Each question carries 04 marks and total time duration to solves these 150 questions are 180 minutes ( 03 Hours). Candidates will be able to check the complete UP Engineering Entrance Exam Pattern 2017 by following the details above. 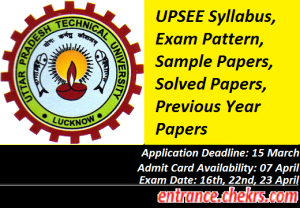 For any type of assistance, while accessing the Syllabus/ Exam Pattern of UPSEEE 2017, you can contact us by leaving your comments at the end of the post.